The Dunsley Highlander 8 has 2 cast iron doors with viewing panels made of glass. The log length is up to 460mm. The Highlander stove has got air wash system. Knobbs on doors are available in black, brass or polished steel. can burn wood or fossil fuel. Recently had this stove fitted by local company. 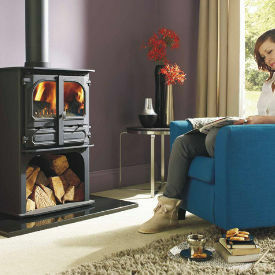 The stove is fantastic - burns extremely well overnight, fuel efficient - Best thing I have ever had installed! Stove expert replied: Routine maintenance is important and should not be missed to insure the stove works as efficiently and effectively as possible..
Stove expert replied: I would try smokeless fuel in the stove as you may find this will give a better heat output to room and water being a concentrated pro-longed heat source. If you decide to remove this stove YOU MUST NOT FILL THE BOILER WITH SAND AND USE AS A DRY STOVE, this was advice given by the health an safety department several years ago. I would suggest selling it to someone wanting a boiler model. The Dove will give you 10kW's to water and 2kW's to room should you opt for this model in the future. I would suggest getting your requirements calculated by a heating engineer to insure that the stove is able to provide your requirements. 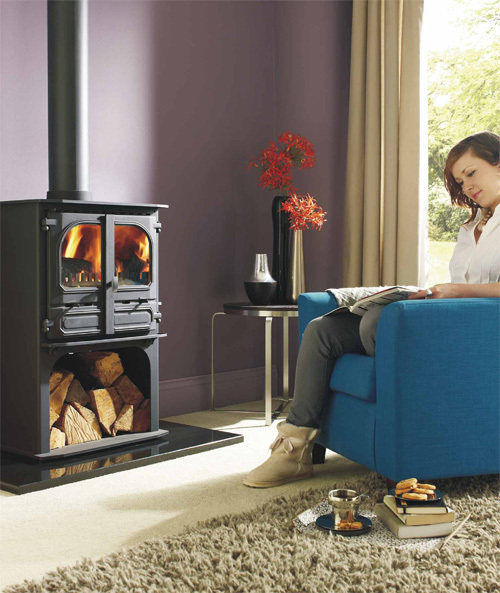 The Dunsley Highlander 5 stove gives out up to 5kW of heat making it suited to the small living room.